Which do you want first? Good news or bad? As you have probably heard by now from other dyers, the cost of cotton and wool has risen dramatically and recently significant increases by our supplier have made it necessary for us to raise our prices as well. We have not had to raise our prices for at least three years, and normally I would not even make any announcements about it, but I have worked out a way to ease the transition a bit. We are hoping that by giving a volume discount on orders of three or more of any yarn, not already discounted, we can absorb some of the cost and hold down prices at or a little below our previous prices. So, in other words, if you are ordering at least three of a kind you can still pay at or below the old price. The only exception is on the Organic Cotton in the Vanilla. We aren’t raising the price on the remaining stock of Latte and Pebble at all. We can’t re-purchase these colors and so will just sell it at the old price until stock runs out. We are offering the volume discount on the Vanilla Organic Cotton, but it isn’t quite as low as our old price since the price on the cotton rose much more than the wool in comparison. So in summary, the bad news is unavoidable price increases; but the good news is the volume discounts which we hope will ease the impact for all of us. Okay now that that is out of the way, how about some knitting content? 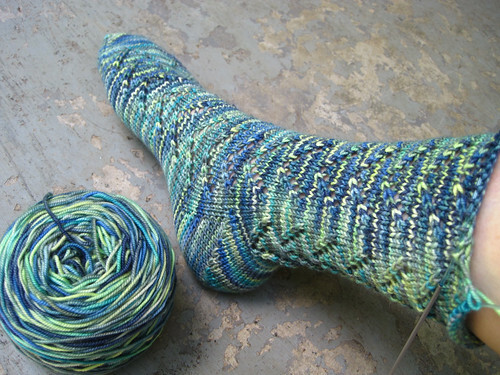 I don’t have much to show you but I am on the cuff of my first Van Dyke sock in the Socks That Rock. Oh, I don’t remember if I told you that I was reading The Help. Everyone is reading it so I got on the library list for it in eBook format, and my number finally came up a couple weeks ago. Now I know why it is so popular. I enjoyed this a lot. I really loved the characters, well expect for Hilly and Elizabeth, who you aren’t supposed to like anyway. They are the antagonists after all. I was drawn into the lives of the heroines. I liked the authors style of having the alternating speakers. It is around 400 pages and a very chatty and easy read, but at the same time the subject matter is very deep. Check it out! Okay that’s it for now. Have a wonderful Sunday!